The global tert-butanol market features a largely consolidated vendor ecosystem as the top five players account for a combined share of over 43.2%. These players are Lotte Chemical Titan Corporation, LyondellBasell Industries Holdings B.V., Evonik Industries AG, Merck KGaA, and TonenGeneral Sekiyu K.K. Numerous top players retain their strong hold in the global tert-butanol market based on constant efforts to diversify their products and bring innovations. Several prominent players are also focusing on maintaining a robust rapport with their clients, which helps them stay ahead of their peers. The presence of several regional players in the global tert-butanol market who are increasingly developing low-cost products offers stiff competition to big incumbent players, usually with global footprints. The global tert-butanol market is forecasted to garner a CAGR of nearly 6.2% during 2016 to 2024. The market is projected to rise to incremental opportunity of about US$2.6 bn by the end of 2024. 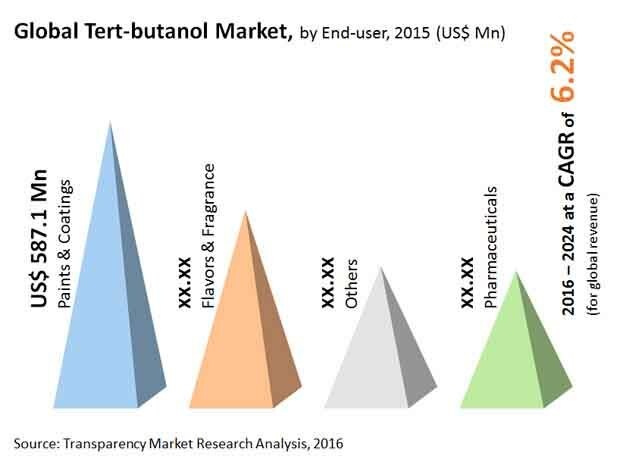 Among the broad types of paints & coatings, flavors & fragrance, and pharmaceuticals led the global tert-butanol market in 2016 and is anticipated to hold a massive share in the coming years, as well. This is attributed to their extensive demand in significant growth of the construction, automobile, and foods and beverages sectors. Regionally, Asia-Pacific led the sway in the global tert-butanol market holding nearly 40.0% in 2015. This region is expected to retain the lead throughout the assessment period, on account of the prevailing favorable paints and coatings in automotive and construction landscape. The uptake of tert-butanol is fueled by rising number of surgeries in the region. Economic development in various parts of the world have helped ascend the disposable income, helping the market to rise further. Tert-butanol finds its application in various industries such as pharmaceuticals, paints and coatings, and flavor and fragrances. Of these, paints and coatings industry held a whopping share of 35%. Another factor that has helped the market expand smoothly is the aggressive growth in automotive industry across the world. As mentioned before, rise in disposable income has helped the consumer buy vehicles, which had a direct influence on the growth of tert-butatnol market. Robust expansion of automotive industry is increasing the sales of paints and coating products, which is fostering growth in the global tert-butanol market. Emerging countries are witnessing a strong growth in construction activities owing to rise in commercial buildings, renovation and other factors. Surge in construction activities have lifted paints and coatings market. Rise in demand for hospitals, amusement parks, schools, and other in developing region is anticipated to help market. There’s another important industry helping the global tert-butanol market to grow is the pharmaceuticals industry. Steady growth of pharmaceutical industry is anticipated to bolster the demand of product. Growth in personal care product owing to change in lifestyle along with preference to live healthy life is anticipated to help the market to grow. Application of tert-butanol in flavors and fragrances is likely to create optimal opportunities for the market.